GrimSuruDoi, one of the developers working on The Sims 4 has shared an interesting thread over on The Sims Forums. Every year he likes to start a March Madness competition for the entire Sims Team to participate in. Previously they’ve done voting for the best movies, series theme songs and more but this year they want to get more involved with the community. 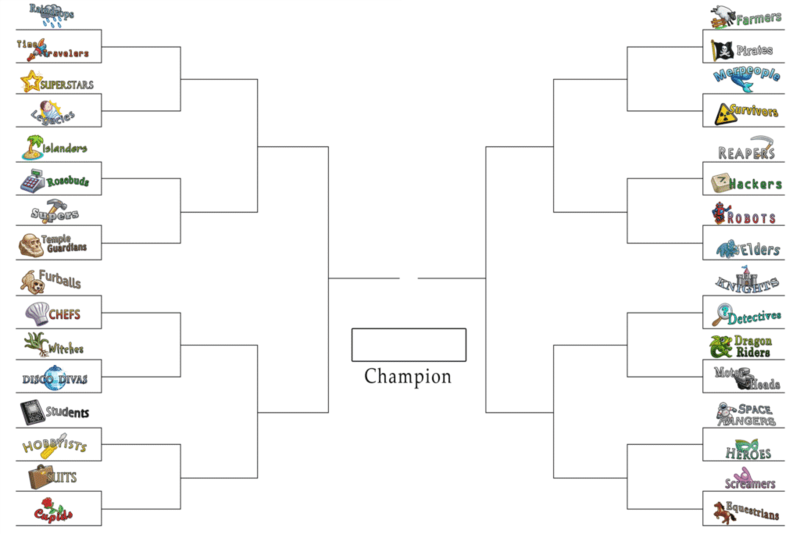 In their 2019 March Madness the entire Sims Team has decided to put together an interesting graph with multiple content themes that have been covered in The Sims Franchise. Those include Legacies, Superstars, Students, Time Travelers and many more. In this voting you’ll be able to choose your favorite Content Theme and find out which aspect in The Sims Franchise is the community’s favorite! Please note that this is just a fun little competition made by The Sims Team for the simming community and probably won’t have any impact on prioritizing what the next few packs for The Sims 4 could be. You can share your vote by clicking the button down below! Definitely Farmers for me! There would be so much more fun in the gameplay , Growing crops and raising cattle and other farm animals! I’m only able to vote for the left side of the bracket! Is there a way to vote on the right side as well? Nevermind!! The “western half”!! I missed that wording the first time. Witches, Witches, Witches! next pack please. Nectar making can be in a Farmer Expansion. I want Farmers!! Witches, time travellers and robots for me. Vampires, Vampires, Vampires and more Vampires. How come that doesn’t even feature? All my played Sims since I got Sims 2 Double Deluxe have been Vampires. Sims 1 I had only base game so had to make do with just making them nocturnal goths. I only got sims 3 recently to compare to the others (was on discount for about £1!) so haven’t explored that much yet. Some of these are paired up really badly. Pets vs Restaurants is a bit of a weird one! I feel like it would have been better to put running businesses vs restaurants since at least they have some similarity on which to compare. Wait, that wasn’t on the list? Time travellers, maybe? Hell, I’m thinking of getting an older Mac just so I can install and play The Sims 3 and all the custom content I had purchased over the Sims 3 store (which I can’t seem to download on macOS 10.14 Mojave). Island paradise , screamers and hobbies lets go. Legacies, students, farmers (more animals! ), and merpeople (I want to be able to swim in the other bodies of water)! as an island where we can have a second home for a beach holiday and swim, hotel. Or University, and The fairy world you have created a world of vampires but no fairies world, it’s not normal. Space ranger, cupids, farmers !! Legacies! Islanders! Students! Farmers! Survivors! Equestrians! I missed it, but STUDENTS! Survivors & Farmers! Woo hoo, this looks awesome. I would take any, so won’t be disappointed by whatever the devs give us. You guys are great, and I love all the content we’ve gotten so far. A lot of these themes look like they’d be crazy fun!